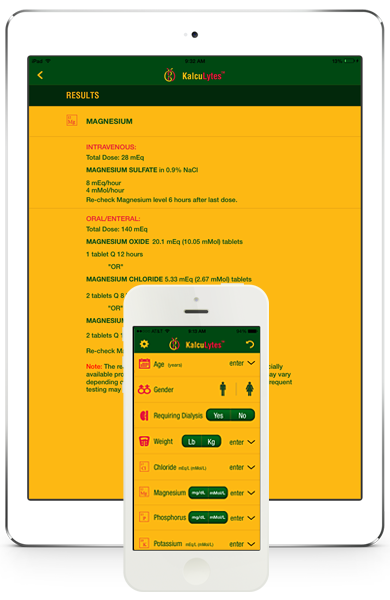 KalcuLytes is an application that is based on copyright formulae developed to calculate the dose and recommend the mode of administration of Magnesium, Phosphorus and Potassium replacement in adult patients with Hypomagnesemia, Hypophosphatemia and Hypokalemia. This app is designed to provide you with electrolyte replacement dosing by intravenous and oral/enteral routes. The dose is individualized based on patient's age, gender, weight, electrolyte levels and renal function. • FREE Download and FREE trial up to 12 calculations! • Calculate the dose and mode of administration for Magnesium, Phosphorus, and Potassium. • In-App purchases for Magnesium, Phosphorus, and Potassium calculations. • Provides electrolyte dosing by intravenous and oral/enteral routes. • See target ranges for electrolyte inputs.